UPDATED 1/2/12: Visit his new Facebook page to leave messages for the family! Simon rested well through the night with stable stats. They might give him an MRI today to give them a better idea of where damage might be. Our neurosurgeon read his latest ct scan and it looks like there might be damage on the left side of his brain possibly caused by a stroke. He isn't moving his right side nearly as much or as strongly as his left. Also some tests came back showing he has some sort of bacterial infection, which he could have had before the hospital since we've been fighting colds. They put him on antibiotics and he has been coughing a lot of gunk up, which is good and shows that it is loosening. Pray that they can move towards the extubation today and waking him up and that he is able to fully recover, especially on his right side. Also pray for clear, positive results from the MRI and wisdom for the doctors & nurses as they proceed and continue to make decisions for Simon's healing. I got home today and was able to use my FB. I greatly amazed at the sheer volume of prayer being lifted up for Simon. I thank GOD so much for all of you. I praise him for protecting Simon through a VERY critical injury. On Thursday night as we were getting the boys ready for bed. Rena's sister was taking Simon out of the bath. She stood him up on on the bathroom floor to wrap the towel down around him and he ran for the door. He slipped as he turned down the hall and fell directly onto his head. He never lost consciousness but showed symptoms of a concussion so Rena brought him to urgent care. While there he threw up so the doctor was concerned that the was an increasing pressure in his head so she sent them to the Hospital for a CT scan. The CT scan showed massive bleeding and later the Neurosurgeon said he had almost died while the ER team were stabilizing him. He was transported to Rady Children's Hospital where he had surgery to stop the bleeding. The fall had apparently cracked on of the cranial bones and it had cut an artery that ran beneath it. The surgeon was incredibly skill and the surgery had a miraculous outcome. The following day they followed up with a second CT scan to determine if there was additional bleeding and to look for damaged brain tissue. There was no additional bleeding but as he has been waking up there was evidence that there was possibly stroke damage. He showed signs of weakness in his right side and the Neurosurgeon restudied the CT scan and identified a small portion of the brain that was damaged that particularly controls movement. That is where we stand. Pray for Simon as the ICU team work to remove the ventilator. Pray for growing strength as he wakes up. Pray that he stays free from infection. Pray that he is responsive to physical therapy as we reach that stage in his recovery. Pray for patience for Rena and I. Pray for Rena's family as they take care of Liam (Simon's big brother). Pray for Liam that he is patient and understands what happened to Simon. Thank you for lifting us up to GOD. Thank you God for holding us in your hands and for your spirit of strength in our hearts. Thank you God for your Spirit of healing in Simon. AMEN. Keep on praying, friends and I will update this page when we have a place setup where you can donate towards the Frey family's expenses with all of this. For now, you can visit this page to message the family. I also wanted to post this prayer that Rena's cousin posted on her FB page, so you can join us in praying it for them. PRAISE from last night (1/1/12)! He just opened one eye really quickly! But he's still going to be asleep and rest for the night to let his lungs heal. Pray that his lungs clear up and that they are able to hear a "leak" which means that his vocal area has decreased in swelling. Also pray that both Jesse and I will get super sufficient and restful sleep tonight. Just fifteen minutes after I had posted about Simon's lungs, the nurse came in and heard a "leak" and another nurse just told me that his lungs while breathing (listening through a stethoscope) sound "really good". God is so powerful! And we continue to pray that we can be a light and a witness to those here at the hospital! I am blown away by God's mercy and grace! Thank you Lord, for being at work in this situation, as literally thousands of believers lift up Simon and the Frey family! You just never expect things like this to happen. A freak thing can turn serious so fast. One of my best friends Rena's youngest son Simon is fighting for his little life right now at Children's Hospital. Would you lift him and his family up in prayer with me? Here's what happened in his mom's own words. It all started Thursday evening, December 29th. He slipped while getting out of the bath and smacked his head on the tile. We went to urgent care where he threw up and now they are sending us to the hospital in an ambulance for a ct scan. Please pray for quickness and clarity of results and peace of mind. He has an epidural hematoma on the surface and is being life-flighted to children's for immediate surgery. Please keep praying. I'm in shock right now. The doctor said Simon's surgery went as well as expected, but he is in really bad shape. The next 24 hours are crucial with the possibility of a stroke. Please keep praying for his brain to heal with full recovery. Simon is stable and was moving/twitching by himself which is a good sign. He should be getting a CT Scan soon to show us how the damage is. Now we just wait and see. Thank you so much for the extent of prayers and encouragement. It is greatly appreciated. God is good & in control and Simon is in His hands. The official ct scan results are not in yet, but the neurosurgeon looked at them and said he was very happy with the results. He said, "Simon isn't out of the woods yet, but I am cautiously optimistic." They could differentiate the white and gray matter which is very good and Simon's brain has gone back to where it is supposed to be and he didn't see signs of a possibility of a stroke. Just waiting now for healing. We just got back from lunch and Simon's blood pressure is elevating, has a fever and his heart rate is very high. Please keep praying!!!!!! They are concerned about this sudden change. Simon's stats are stable and the nurses are encouraged because he is moving slightly when they mess with his intubation. He is still heavily medicated and they are trying to slowly wean him back to consciousness. We were able to go to the Ronald MacDonald house for dinner and showers. Back in Simon's room hoping to get some sleep. Please pray for his stats to remain stable through the night. Jesse and I were able to rest a bit. Simon's stats remained stable through the night, but he's starting to move and wake up and struggle against the intubation, so they are medicating him more. This is a good sign because it shows brain function. Also, he's moving his left side a little, which makes us happy since the damage was on the right side of his brain. Please pray that his temp stays low (it was starting to rise a little bit), so his metabolism can move slowly giving his brain a chance to rest. Also, we are overwhelmed by the amazing amount of people praying for us and feel so encouraged. We serve a powerful, faithful God and we are leaning and trusting in His plan for our son. Thank you so much to everyone for spreading the word of Simon and for caring so much! Rena and Jesse love the Lord and I know that He is going to use this trial in a mighty way in their hearts, no matter what the outcome. He is good and faithful and loving, and I've been thanking Him that He loves little Simon more than anyone on earth. Social media is funny. I feel like we constantly hear complaints of how it's become so all-encompassing in our modern lives. But the thing is, it can be an amazing tool as well. I've been overwhelmed at the sight of hundreds of prayer warriors rallying around my dear friend and her family. 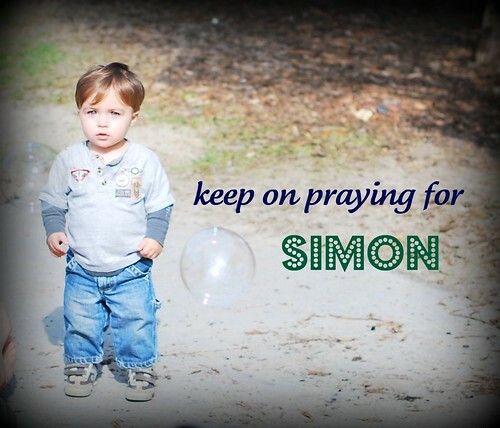 So I just wanted to ask a few more people to pray for Simon's recovery. May the Lord save Him so that this little guy might grow up to do great things for the Lord.